Found a fabulous story earlier this morning that ties in 2 concepts we’ve been following in the last three weeks – social media as a resource and disruptive innovation. Hope you enjoy; it’s a quick, great read! Travis Kalanick sent this tweet out in January 2010. The reply from Ryan Graves came 3 minutes later. That tweet was worth over a billion dollars. Ryan’s reply to Travis came as he was looking for something new. He had some experience at GE, and had worked for Foursquare for a while for free after the company turned him down for a job. He was ready for a new opportunity – and took a chance with this tweet. 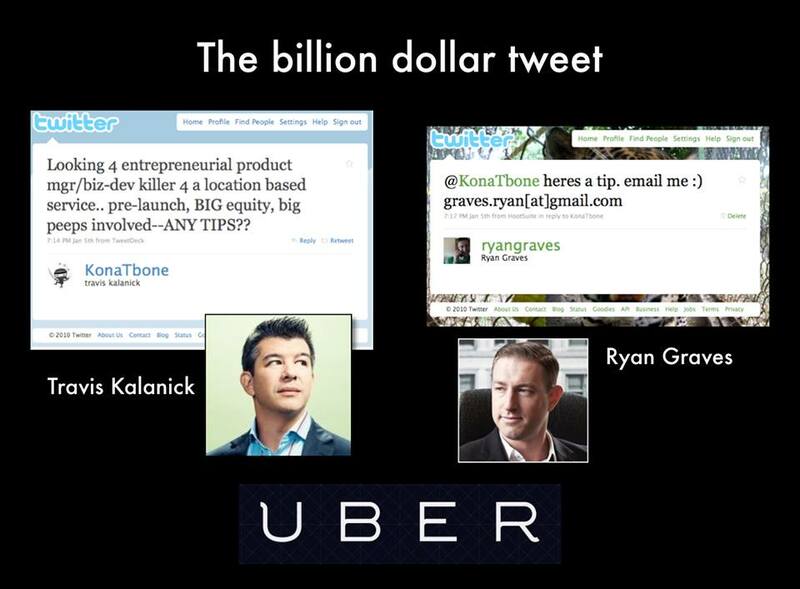 Today, Travis and Ryan are worth over $6 billion, and that tweet from Ryan (who today is Uber’s Head of Global Operations) began a journey which has made him a billionaire today as well. How are you using Facebook, Twitter, LinkedIn and Youtube today? As a wall of content? As a broadcasting tool?